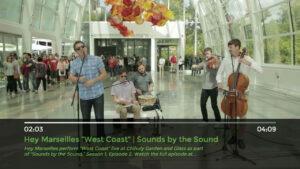 Our popular VISITSEATTLE.tv series “Sounds by the Sound” and “First Takes” are now available to Amazon Fire TV subscribers. Just search for “Visit Seattle” and download the app and you can watch current regular series and short video clips, now all on your giant home television. Crank up the audio for the “Sounds by the Sound” series, currently in its second season on Revolt TV. A long-form series featuring both emerging and established Seattle bands, you’ll see them perform at famous Seattle locales. The Flavr Blue rocks it at CenturyLink Field, Hey Marseilles plays music as artful as the sculptures at Chihuly Garden and Glass, and Tacocat (best band name since Seattle’s own Natalie Portman’s Shaved Head) gives a great show for our sea creature friends at the Seattle Aquarium. It’s such a great way to explore Seattle through the filter of music. My music buff aunt and uncle used to work in a music show whenever planning a trip (The Flaming Lips in Iceland topped their list) and I’ve always tried to do the same. Discover your next favorite Seattle band, and then come see them live. You’ll need some inspiration for dinner, drinks, snacks, coffee, and other memorable experiences, and we’ve got you covered there too. The new VISITSEATTLE.tv Amazon Fire TV app also features Visit Seattle’s “First Takes,” a series of online short films featuring first-time Seattle visitors introduced to city-specific experiences like Pike Place Market, the Seattle Great Wheel, a ferry trip, Easy Street Records and Washington State wine tasting. All videos are shot by celebrated documentary filmmaker and Seattle native Austin Wilson. Be sure to check back often, as content is regularly added. Season three of “Sounds by the Sound” is currently in production, and as of March 21 there are five new “First Takes” for your sensory enjoyment. 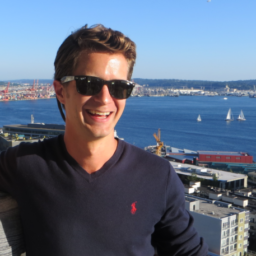 Nick Hawley was a Director of Marketing at Visit Seattle. A Wisconsin transplant, he brought his Midwest appetite for food and beer with him. You can usually spot him running around Lake Union, inhaling delicious food at various Seattle eateries, and enjoying drinks with friends on Capitol Hill.